So you've decided to "tie the knot" and now there is the small matter of a wedding to organise - so where do you start? what are the really important things that you need to do and what things are actually quite trivial, but if you are not careful can end up being a distraction and possibly stressful. These hints & tips do not claim to be an exhaustive check list in any way, but hopefully you will find a few little gems here that will prove useful as either something you hadn't already considered, or maybe just a little piece of advice that puts things into some form of perspective about your big day. We understand that budgets can differ greatly, so as far as possible we will not be talking money, but just about the start to finish process, so whether you are on a tight budget or money no-object, you should find most of the information below to be relevant to you. Your wedding is actually a celebration of your love and commitment for each other. It is about expressing yourselves, but it is not about perfection. You will find that some of the best moments of the day are actually the ones you didn't plan! So don't be phased by the unexpected, just go with it; after all, together you can take on the world. Accept that you might not be able to please absolutely everyone - so don't get too stressed trying! This day is about you, not anyone else, so keep that in mind and everything will be just fine. If possible, start to plan as far ahead as you can, around 14~16 months is a fairly good time-scale. By starting to plan well in advance it really helps to keep the stress levels down. Try to get as much done early on, so as the big day gets closer you really don't have that much to finish and as a result you will approach the wedding in a far more relaxed manner. The other advantage to getting things booked early is you will normally fix the price at the time of booking and we all know that prices tend to rise with time, so the longer you wait the higher the price is likely to be. We are not going to cover what type of venue you should book, this is obviously a very personal thing and needs to match the aspirations and personalities of you and to some extent your guests! Whilst you obviously need to set the wedding date as early as possible, you really then need to have a fairly good idea about the number of guests you are expecting; as you will need this information to help you decide upon a suitable venue to accommodate your guest numbers. You will want a venue large enough to accommodate your guests without being cramped, but not too big otherwise the reception in particular can look "empty" and as a result will possibly be lacking in atmosphere. Don't forget that your guest numbers can also have a large impact on the overall cost of the wedding in venue and catering costs. One quick thing to consider - if you are getting married between October and April - Think carefully about when the sun sets and how light it will be when you emerge as the new Mr & Mrs!! For example in mid November it gets dark around 4pm, meaning if have a church wedding at 3pm, your photographs afterwards are going to be taken in the dark, with flash - really not ideal!!! Once you have decided upon guest numbers and booked the ceremony / reception venues (and have booked the registrars if required), you can then move onto the other things that tend to get booked quite early like the photographer / videographer. This section is not here to sell you our photography services, but to simply say you should be comfortable with your photographer, their work and decide if the overall package they offer represents good value for money. If you have decided on a particular DJ / evening entertainment, then try to get this booked as soon as possible, as just like the photographer they can get booked up quite early (certainly for the popular summer dates). So now is probably time to take a breath and review what you have achieved already - which is a lot! There is still much to be done, but give yourselves a little time out and congratulate yourselves - you're getting married!! Gift List - Think carefully about what pressies you ask for, they can be worth a significant amount of cash! Some couples find it best to get some of the "smaller" things like Stationery / Favours out the way at this point. Otherwise these smaller things can get left too late and then become quite stressful trying to sort them out close to the wedding day. Keep all your wedding vendor telephone numbers stored in your mobile, so you can always make contact with the minimum of fuss. Don't get caught out with "hidden extras" from any of your vendors. Make sure you are clear on exactly what you get and most importantly what you DON'T get for your money. For example does the photography package actually include the album, or is this extra? or will the venue charge you extra for corkage or even for the use of their cake knife to cut the cake - it has been known! PS) Do you know how to ensure you get stunning wedding photographs? Well check out these tips on getting great photos by clicking this link. So you have done all the planning and the big day is just round the corner. Now is the time to relax and get a good nights sleep - possibly easier said than done, but do try your best to remain stress free and calm. The Bride could maybe relax with the bridesmaids and, watch a couple of nice romantic films; whilst the Groom should avoid too much alcohol and to help focus his mind he should make a final list of the things he needs to do in the morning. The big day is finally here!!!!! You will probably wake early and hopefully without a hangover! You could be getting ready at home or at the venue, but in either case the single biggest tip we could give you, is do not have too many people with you! We have seen instances where the bride has had up to 12 people with her in a single hotel room - and as you can imagine it was absolute chaos, with the end result being a very very stressed bride. Yes you need to have your hair and makeup done, and you will need some help with your dress, but you don't need 12 people getting in your way - keep it simple. Mum, the bridesmaids, hair and makeup and the photographer (who if they are good will know when to leave you alone and come back later) are really all you need, with Dad arriving at the last minute. It sounds obvious, but don't forget to wear a button up top to have your hair and makeup done, otherwise you risk ruining all the good work by later having to pull a top over your head! Onesies are a great choice for this! The Wedding Dress normally takes around 15~20 minutes to get into and laced up, but our advice is not to put it on too soon! we have seen brides with their dress on and ready, up to 90 minutes before the ceremony and they simply got too hot and uncomfortable, so don't rush to get the dress on too early! This is also a good time to go through any last minute instructions with your bridesmaids - confirming the order for walking down the aisle for example. It's time - all the months of planning has been the countdown for this - your marriage. Now is the time to smile and savor every moment, now is the time to slow down, don't rush. For example - don't rush to get out of the car, let the photographer get some wonderful photos of you in the car and then with your bridesmaids and father by the car. When you walk down the aisle take it slow. Yes we know you can't wait to get married, but seriously walk slowly! savor the smiles from your guests as you pass them by, let the photographer get some lovely shots of you, let your groom turn his head to sneak his first glance of his beautiful bride. One final tip as you walk down the aisle - if you go first then just walk slow as described above, but if you are going last behind the bridesmaids then leave a large gap before you start your journey down the aisle - if you don't leave a large gap the photographer will simply not be able to get a clear photograph of you as you walk forward, there will be bridesmaids in the way. Leave a large gap and get great photos! You've done it - you're married!!!!! Shortly after the ceremony you will probably have some formal group photographs of family and friends. It's a great opportunity for families who are not often all together in one place to have some lovely photographs together. But, before you even booked your photographer you really should have decided on one very important consideration. Do you want the photographer to largely record the day as it unfolds, to capture all those wonderful natural moments, with as many family group photos as you desire, OR do you want a photographer who will take far greater control of your day to get the shots they feel showcases their style better. This may even involve staging certain photographs with props and special lighting and could even mean they require you at a certain time when the sunlight is just right; even if this is mid-way through your meal! 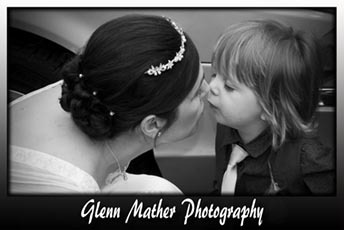 Just to be clear, at Glenn Mather Photographers we prefer to get the natural shots of you and your guests, (with maybe just a few little arranged romantic shots of the bride and groom) with as many formal group shots as you want - Our philosophy is simple - this is your wedding, not our photo shoot!! we don't control you, rather it's the other way round, whatever you want is what you get - it's your day! So, back to the family / friends group shots - The main tip is definitely do a list of all the group shots you want; including any you might feel are obvious, like groom and best man or bride and bridesmaids - list them all, then on the day it helps to make sure no-one gets forgotten! After the formal group shots, it is often immediately followed by bride and groom photographs with the photographer, whilst the guests relax with a few drinks. The bride and groom photographs can be a good time for them to spend a few minutes together often for the first time as Mr & Mrs. The best photographs of the bride and groom are often natural ones as they talk and walk together with the photographer using a long lens to capture their first walk together. There are two main tips to give you during this time. The first is to listen to the photographer, who should have plenty of experience in helping the couple to feel relaxed in front of the camera and the second is to treat the front of the lens as a best friend. If the photographer asks you to look at the camera, then simply look directly at the lens in a relaxed manner. The difference in the finished photograph by looking directly at the front of the lens as opposed to just looking somewhere nearby can be staggering. Love the lens and you will love your photographs. Okay, so you're married, you've had your formal photographs, now it's time for you and your guests to sit down, relax and enjoy some nice food and drink. Most venues will normally arrange for the guests to be seated first, then will announce you into the room as the new Mr & Mrs to rapturous applause. Apart from the food and drink, the other main element to the wedding breakfast is of course the speeches. Traditionally these take place at the end of the meal, possibly during the coffee; however a significant number of weddings we attend do have the speeches before the food. So why have the speeches at the end of the meal - well, people may feel more relaxed having had a few more to drink? and people may find the "jokes" a little funnier having had more to drink. Having the speeches before the food could be best if any of the speakers are "nervous" about standing up and speaking in front of a large number of people. This way they get it out the way and can then hopefully enjoy their food without worrying about still having to get up to speak. The speeches can be anything from a few simple "Thank you's" right through to multimedia presentations with slides, videos, handouts etc etc. They can be serious, funny or somewhere in between. All are fine, but do try to ensure they do not offend anyone in the room, the best man embarrassing the groom is pretty normal, but keep it clean if there are young children in the room. If you have any "thank you" gifts to hand out then these are normally done during the grooms speech. Some of the best photographs of the speeches are not actually the speaker, but the reaction shots of guests or members of the wedding party as they laugh or cry. After the Wedding Breakfast there is normally a bit of a lull before the evening reception gets going. The venue and DJ will normally need around 60~90 minutes to get the room layout turned around from Wedding Breakfast to Evening Reception. During this time you and your guests have time to relax and catch up together over a few drinks. As photographers we often use this time to get a few nice portrait photographs of any couples who may want to; sometimes with the Bride and Groom, but often just the two of them (or possibly a nice family shot with their children). So what are the main elements of the evening reception. The main one is to party, celebrate your marriage and for everyone to have fun. You will possibly have a few extra evening only guests arriving, so you will want to spend some time with them as they arrive. The other things that will normally occur during the evening are the cutting of the cake and of course your first dance. We find that normally these two things are best done together, so the DJ will normally announce that the Bride and Groom are about to cut the cake; so everyone will be ready with their cameras and phones to take pictures as you cut the cake, after which the Bride and Groom will then head straight on to the dance floor for their first dance together. Very occasionally couples have worked on a choreographed dance routine, but mostly they will lovingly and slowly glide around the dance floor to their favorite music. As photographers we find this is a wonderful opportunity to get some lovely romantic photographs for the happy couple and the one tip we have for you here is to make sure the venue DOESNT turn the room lights up. Keep them low, with the DJ using his full coloured lighting. Crazy as this may appear, this can result in some fantastic first dance shots. Often as the first dance comes to an end the Bride and Groom will invite everyone else onto the dance floor and this can signal the start of the evening celebrations as the guests join in to party the night away! Only a couple of thoughts for you to consider here. Firstly are you having a Honeymoon? with today's economic climate it is not always possible and secondly if you are taking a Honeymoon, when will you go? We have spoken to couples after the Wedding, who said getting up early the morning after the wedding, having to travel to the airport and then spend hours on a flight was no fun! So, if you feel you may be a little worse for wear the next morning, then you may possibly want to arrange your Honeymoon for sometime later. Thank you for taking the time to read through this section, we really do hope you found it useful. Our parting thought for you is this - "You've made the serious decision to get married - so on the day.. ..RELAX, GO WITH THE FLOW, SAVOUR EVERY MOMMENT & ENJOY THE START OF YOUR LIFE TOGETHER"
PS) If there is something we didn't cover and you would like to ask, then please do contact us (it doesn't matter if you haven't booked us!) We love to talk weddings and would be more than happy to give you the benefit of our years of experience. Copyright 2018 Glenn Mather Wedding Photography Nottingham. All Rights Reserved.